I love the 4th of July. Not because I’m necessarily that Patriot (yay America! ), but because I love being out in the middle of the day, in the warm sun, with a bunch of friends, grilling, swimming, running around in the grass and having a good time. And the food. I love BBQs, but really – who doesn’t? I’ve gathered a couple tried and tested 4th of July Recipes that I’ve adapted to be Paleo. I don’t have pictures of them as I only started being the weirdo who takes pictures of my food recently (thanks for that, blogging world), but I’ve added some from the non-paleo websites if I can find them. 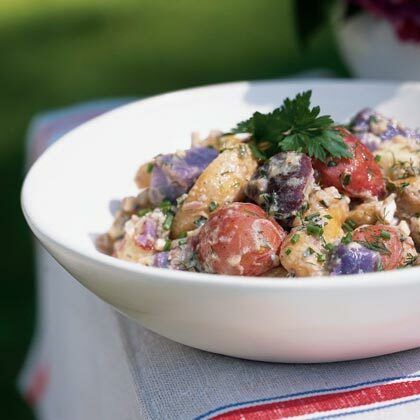 I made this recipe my last 4th of July in LA and had to go to 4 different Whole Foods to find blue/purple potatoes, but it was so worth it. While the Paleo version is not colored, the salad is tangy and delicious, perfect for a hot day. 1. Boil potatoes (or steam) for about 15-20 minutes or until tender. Cut into small cubes and allow to cool slightly. 2. Mix in onion, parsley, dill, chives and egg. 3. Combine all ingredients from vinegar down in bowl and mix together. Pour over potato mixture. Chill for 20-30 minutes and serve. I always forget just how amazing grilled chicken is. I use my George Forman every day, but it does not even begin to compare to that real smokey flavor of chicken pulled straight off the grill. 2. 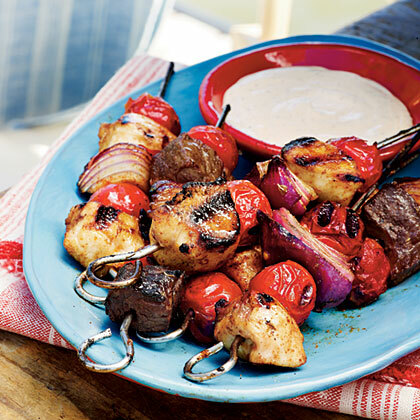 Mix all ingredients but the honey in a bowl, then rub onto skewers. Drizzle skewers with honey. 3. Grill until done, about 4-5 min each side. I’m calling it a SoCal burger, but it will could be a “Southwest” burger. It’s pretty much my favorite kind, combines all the flavors I love into one. Serve over a bed of mixed greens with some sweet potatoes fries (baked, not fried). 2 Jalapeño Peppers, including seeds, finely chopped up. Wear gloves when doing this, or make sure to wash you hands multiple times after and don’t touch your eyes/mouth/any sensitive area. 1. Mix ground beef with chopped up Jalapenos and garlic powder. Form into patties, with a thumb print in the middle (helps it cook more evenly) and grill until done. 2. Combine mashed avocado, lime juice, chopped tomatoes pinch of salt and pepper. 3. Take 1/4-1/2 of poblano, however much you want, place on top of burger. Top with the avocado mixture and enjoy. I promise if you try any of those ideas you will not regret it. Most importantly have fun, be safe and be thankful for all the great things that come along with living in America! This entry was posted in Uncategorized and tagged 4th of july, diet, Paleo, recipes by fionaboger. Bookmark the permalink.